The Terracotta Army was built by the subjects of Qin Shi Huang, First Emperor of the Qin Dynasty and China&apos;s 2,133-year imperial era. According to Records of the Grand Historian, Qin Shi Huang ordered construction of his mausoleum to begin when he took the throne of the Qin State in 246 BC. 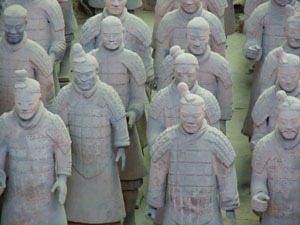 The role of the Terracotta Army was to "guard" the entire mausoleum and Qin Shi Huang believed that the army could protect him in the afterlife. 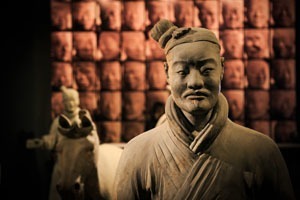 Qin Shi Huang instigated the construction of the Terracotta Army as soon as he assumed the Qin state throne in 246 BC, though most decisions were made by officials as he was only 13. Over 700,000 laborers worked around the clock for 36 years on the Terracotta Army and the tomb complex. Time-consuming: The project was still underway 36 years after it began, cut short by Qin Shi Huang&apos;s sudden death. Cost: The amount is unknown. As a dictatorial ruler, Qin Shi Huang would not have paid much to the workers. The team of potters who made the Terracotta Army included imperial craftsmen and folk craftsmen. As a way to mark their own pieces of work and to ensure the standard of quality, each craftsman carved his name into the pottery figurines he created. This method originated from the Qin government during the middle of the Warring States Period. By adopting this method, the government could manage the handicraft industry, guarantee the quality of the products, and control and supervise the production levels of the craftsmen. As well as a craftsman&apos;s name, place names were added on some pottery figurines before the personal names. The construction of the Terracotta Army did not follow its original plan. Due to the sudden death of Qin Shi Huang in 210 BC, the tomb had to be sealed ahead of schedule. According to historical records, all the craftsmen who participated in the mausoleum project were buried alive in the burial pits around the tomb in order to keep the secrets of the Terracotta Army from being discovered. 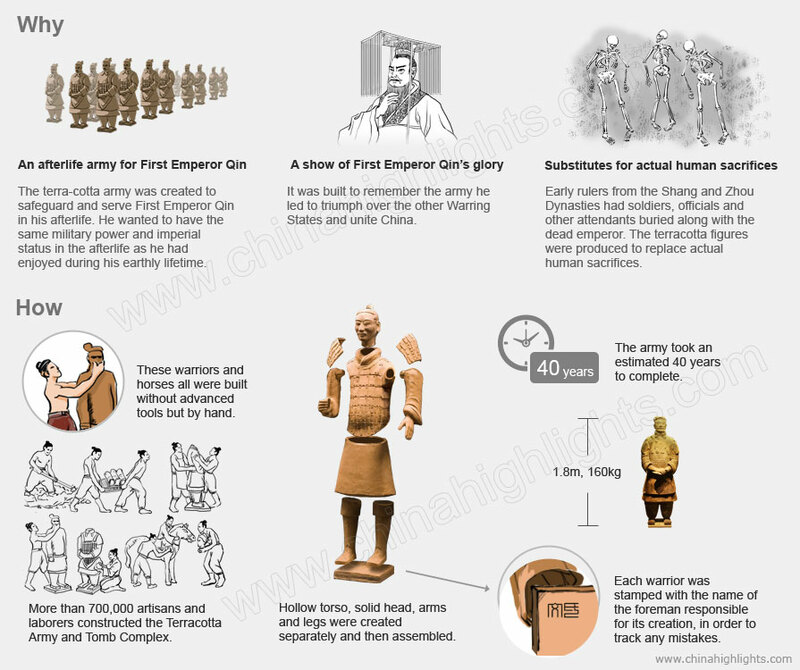 There are three popular explanations as to why the Terracotta Army was constructed. Emperor Qin Shi Huang wanted to receive the same grand service and treatment in his afterlife that were given to him while he was alive. At the site where the Terracotta Army was discovered, more than 8,000 soldiers, 130 chariots, and 670 horses have been uncovered. 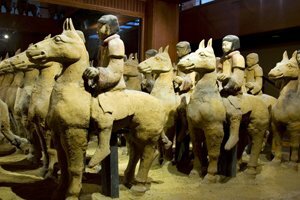 Terracotta musicians, acrobats, and concubines have also been found. 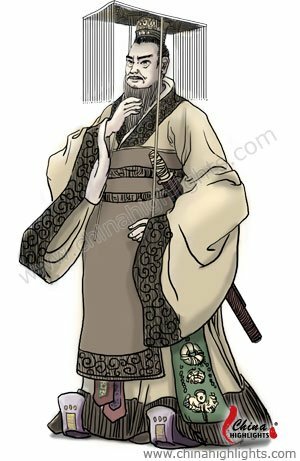 Emperor Qin Shi Huang unified China for the first time and he named himself Qin Shi Huang, which literally means &apos;First Emperor of the Qin Dynasty&apos;. Under his rule, the political, economic, and social development of the country advanced a great deal. It&apos;s said that the Terracotta Army was built in honor of the army he led to triumph over the other states and to unify China. Earlier dynasties, such as the Shang and Zhou dynasties, had actual human sacrifices buried with the deceased rulers. These sacrifices included soldiers, officials, slaves, and other attendants to the particular ruler. 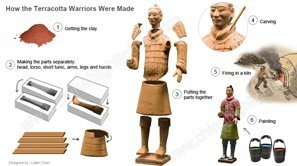 The terracotta warriors were made to serve as substitutes for the real warriors they represented in order to avoid making actual human sacrifices. 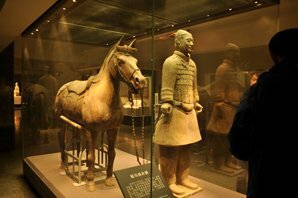 The Terracotta Warriors and Horses are rich in history and culture. It is advisable to travel with a knowledgeable guide who can share the background information with you and help you to avoid the crowds. 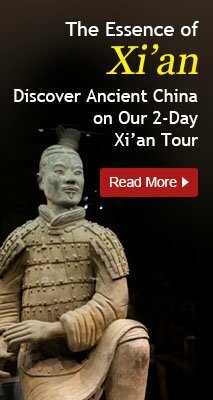 4-Day Xi&apos;an Ancient Relics Tour: Discover more of Xi&apos;an — the capital of 13 ancient dynasties — and explore China&apos;s ancient culture. The Golden Triangle (Beijing, Xi&apos;an, and Shanghai): Visit China&apos;s classic sites in this 8-day tour — our best seller. See more of our Xi&apos;an tours. 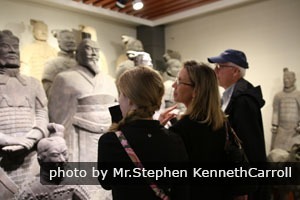 Our tours are customizable — tell us your interests and we will help you to tailor-make a Xi&apos;an tour.